A watermark is a faint logo or words superimposed on top of an image. 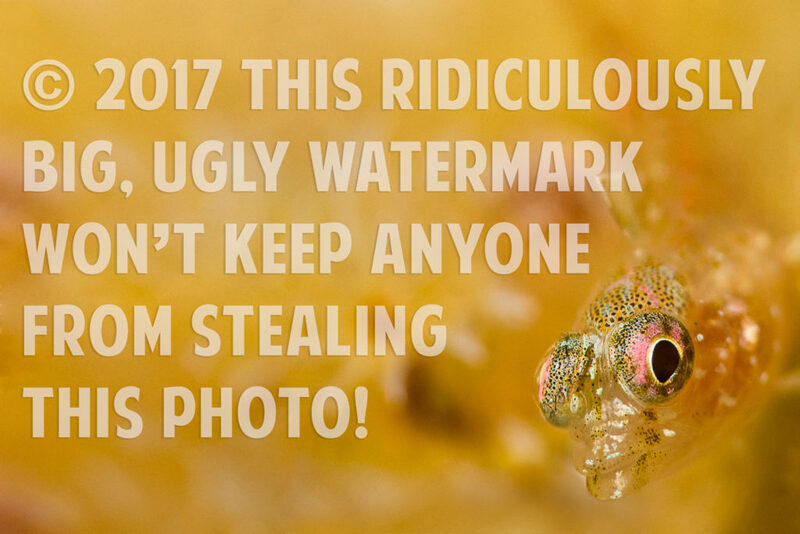 The idea of placing a watermark on your photos is to prevent others from trying to copy and use the photo without permission. Although a watermark identifies you as the creator of your photo, it won’t stop someone from swiping it, no matter how big or bold you make it. Additionally, if you cover the entire image with a distracting logo, you compromise the visual impact of the shot. 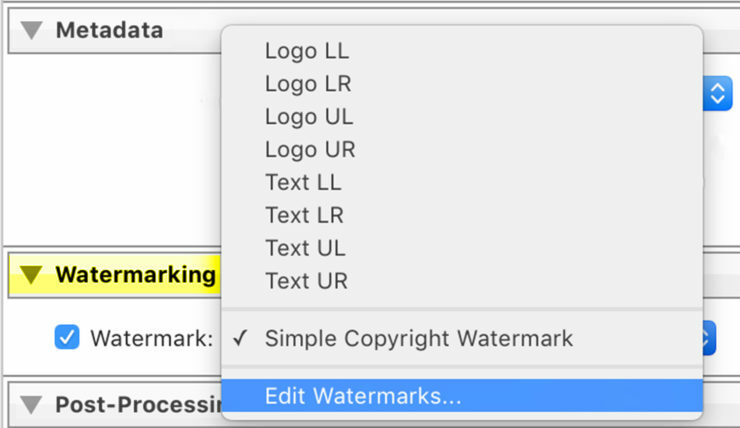 To launch the Watermark Editor from any module in Lightroom, go to the top menu and select Lightroom>Edit Watermarks… (Mac), or Edit>Edit Watermarks… (PC). 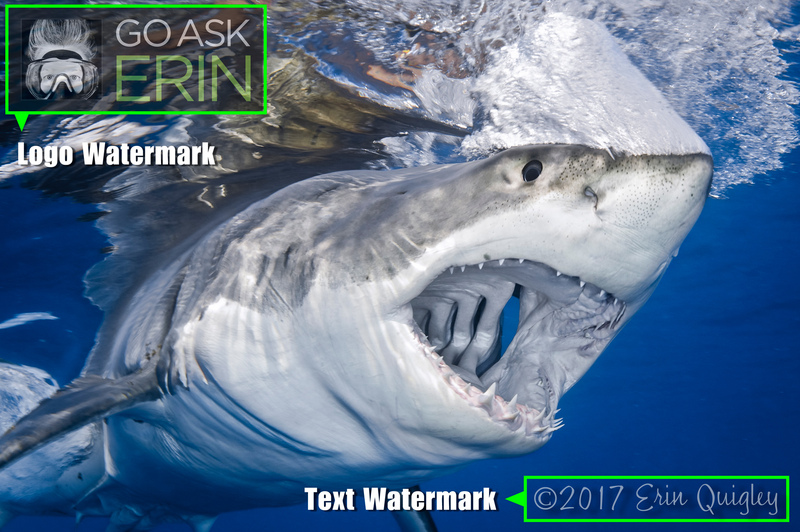 To create a text-based watermark, find “Watermark Style:” at the top right of the Watermark Editor panel, and activate the “Text” button. Type the text for your watermark in the text editor box under the preview window. Select a Font from the dropdown menu. Select a Style for the font (Regular, Bold, Italic, etc.). Not every font has multiple styles. Choose the alignment for your text. 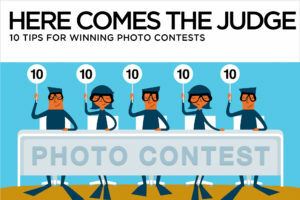 This only applies to lines of text, not to the alignment of the watermark in the image. 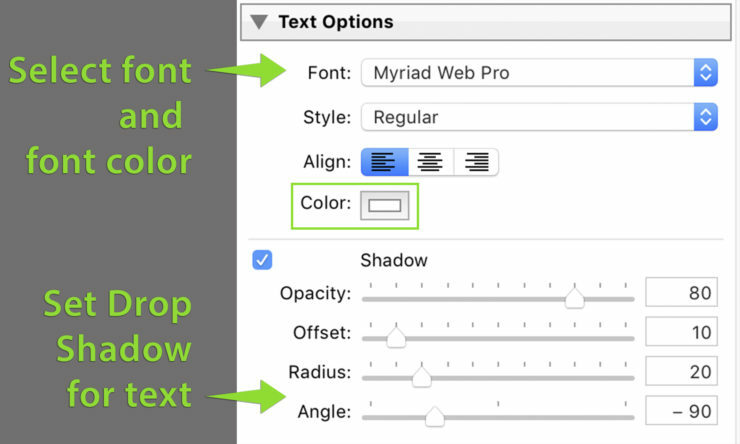 Choose the color for your font by clicking the small, rectangular color icon. 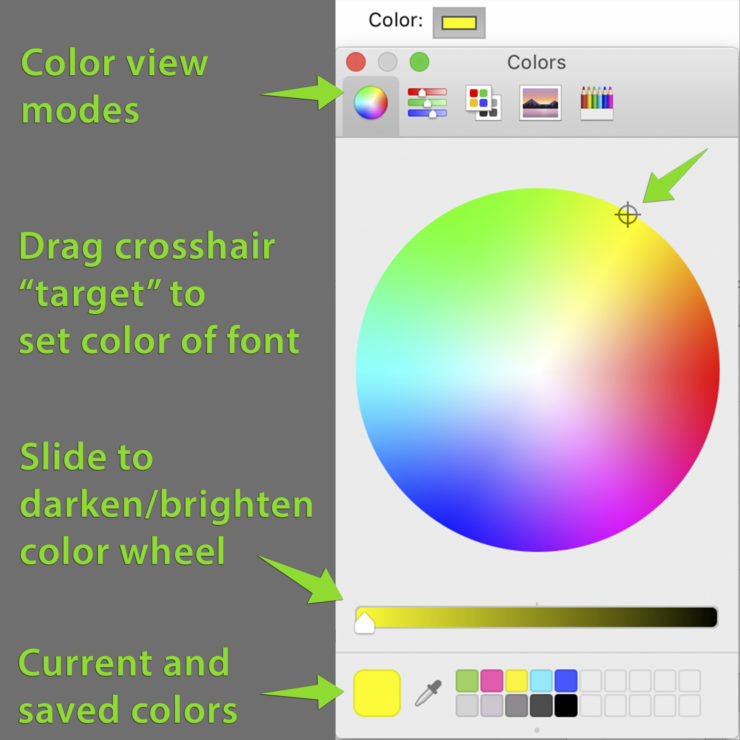 There are five different icons at the top of the color selector box, which toggle various methods for selecting color. I usually stick with the first icon on the left, the RGB color wheel. Click anywhere in the wheel to set the font color. The gradient slider beneath the wheel darkens or brightens the available spectrum. The currently selected color is displayed in a “swatch” at the bottom of the window. Drag that color to one of the smaller swatches on the right to save it for a future watermark. 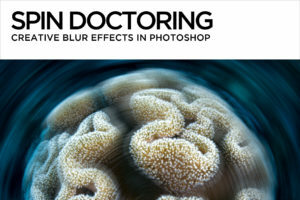 The neighboring eyedropper samples color directly from the photo. To match a color from your photo, grab the eyedropper and click directly on the desired color in your picture. Add a drop shadow if desired. Choose the Opacity of your watermark by moving the Opacity slider. A value of 50 or less is best. 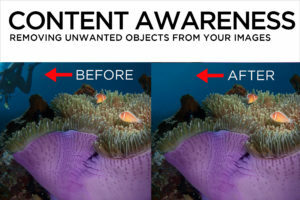 Adjust the size of your watermark. Either activate the “Proportional” button in the “Size;” section of the panel, and adjust the slider below, or click and drag directly on one of the corners of the watermark in the preview window. 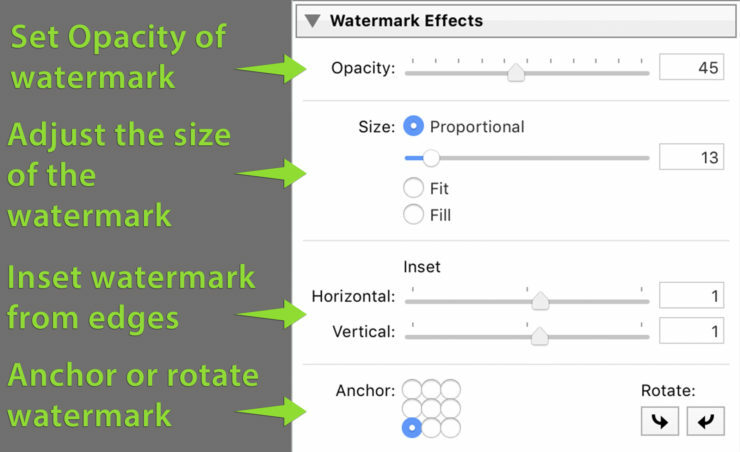 Click inside the “Anchor:” icon at the bottom left of the Watermark Effects panel to place your watermark at the top, bottom, center, left or right. The nearby “Rotate:” arrows change the orientation of the watermark. Adjust the horizontal and vertical “Inset” sliders so that the watermark isn’t mashed up against the edge of the photo. 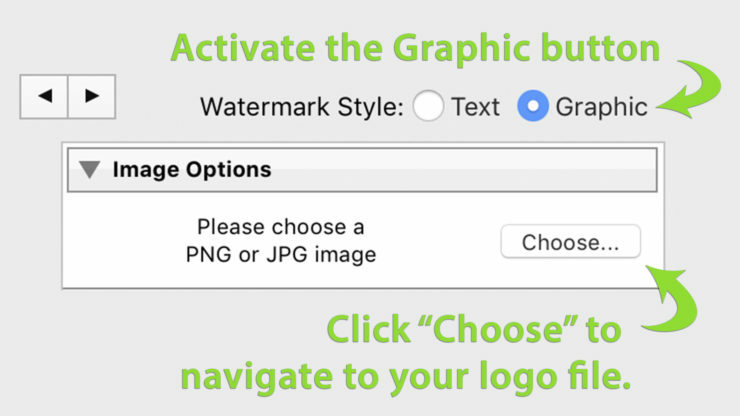 To watermark using a logo or other graphic, find the “Watermark Style:” area at the top right of the Watermark Editor, and activate the “Graphic” button. Alternatively, click on the “Choose” button in the Image Option section of the Watermark Editor. 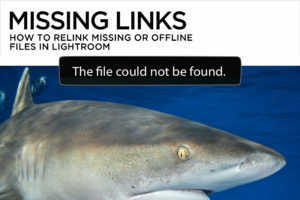 In the ensuing browser, navigate to the desired PNG or JPG logo image. The Text Options panel will be grayed out, but all of the tools in the Watermarks Effects panel remain accessible. When your watermark is ready, click the Save button at the bottom of the Watermark Editor. In the New Preset dialog box, give your watermark a name. I usually name the preset something like “Logo LR” to describe the content and location of the watermark. 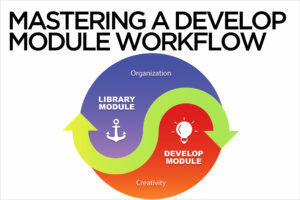 In the Library Module, select the images to export, and click on the Export button or go to File>Export. 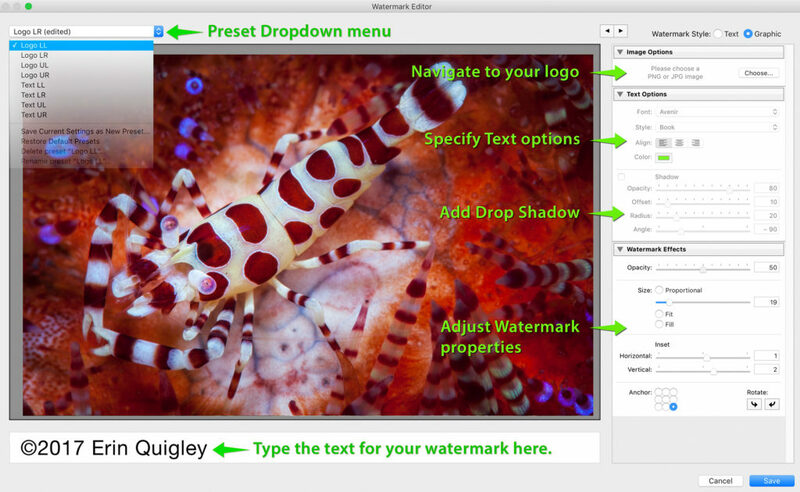 Check ON the Watermark checkbox, and either choose an existing preset, or scroll down to the bottom of the preset menu and choose “Edit Watermarks…” to access the Watermark Editor. Watermarks can be applied to one image at a time, or to multiple images simultaneously, but you can’t select different watermark locations for each individual image in a batch export. Clicking the arrows at the top of the Watermark Editor let you toggle through multiple images to make sure the placement looks right on each one.